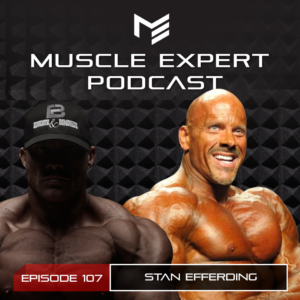 Stan Efferding, the World’s Strongest Bodybuilder, is the master of many areas of health and fitness, he is a retired powerlifter and body builder and creator of the Vertical Diet. His clients include Brian Shaw, Ben Smith, Hafthor Bjornsson and many more. Ben and Stan go deep on the vertical diet, why Stan believes that you need to look beyond your macros, protein sources and the sustainability of the vertical diet. This episode is brought to you by ATP Labs. Check out this weeks recommended product Vitamin D3 and use code Ben10 to receive 10% off of your total order. 1:30- Do No Harm. How Stan has evolved his training an nutrition style to support his health. 5:00- The importance of health while bulking. Why Stan has evolved his thinking when it comes to bulking. 7:30- The importance of eating foods that agree with YOUR body not necessarily traditional diets. 10:15- What is the Vertical Diet and how did Stan come up with it? 12:44- The importance of fruit, hydration and the fourth phase of water. 15:00- Nutrient timing. Why Stan believes that consuming micronutrients through the day is extremely important. 18:50- Salt’s influence on hydration and performance. 22:45- Optimizing nutrients rather than calories. How to optimize your diet without caloric restriction. 29:00- How Stan took Thor from 440 lbs to 395 lbs and increased his performance. 31:00- Foods not to eat. Stan’s framework for the vertical diet and optimizing performance and health. 35:15- Why quality food matters more to competitors and why you don’t know how poorly you feel until you experience what feeling great is. 41:00- Stan’s take on the “myth” of alkalized water. 44:15- Hydration and salt. Stan’s take on hydration, blood pressure and performance. 50:30- STOP EATING JUST THE EGG WHITES! Why yolks are necessary for micro nutrient intake. 53:00- What can you eat on the Vertical Diet? 58:00- Steak vs Chicken. Why Stan prefers red meat over poultry. 1:04:00- The biggest mistakes people are making when implementing the vertical diet. 1:09:00- How restrictive is the Vertical Diet? 1:10:45- The results. Stan shows some before and afters of himself and his clients. Check out the video podcast on YouTube to see!